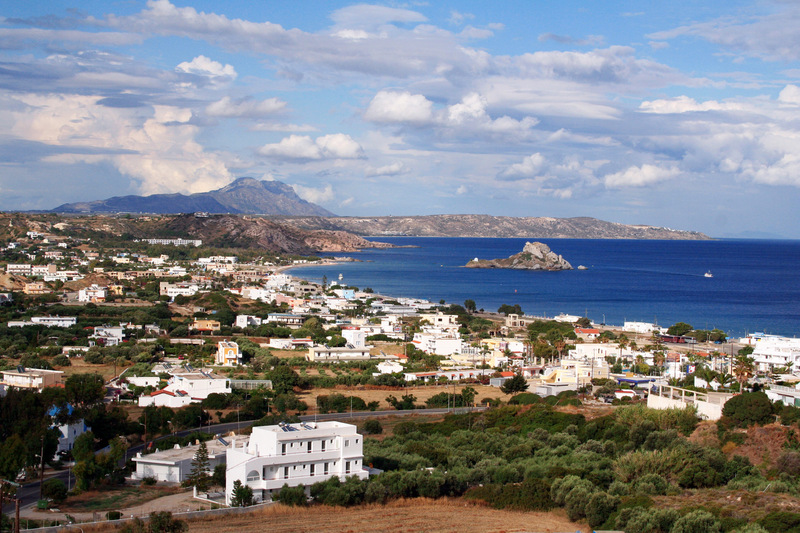 At a distance of only 3 miles (5 km) from the mainland, Kos is one of the closest large Greek islands to Turkey. 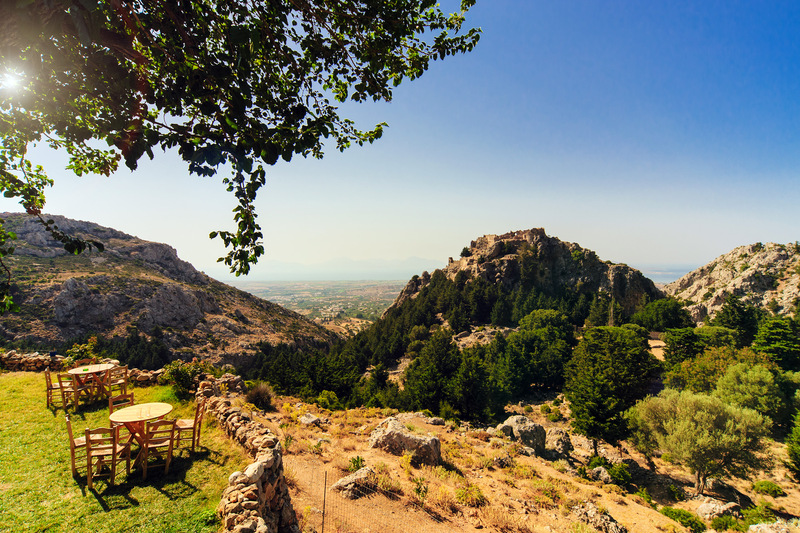 With its archeological ruins, medieval castle, and pristine beaches, Kos has something for everyone. Kos City, on circular, narrow-mouthed Mandraki Harbor on the island's northeast coast, is a picturesque little place of minarets and churches, bars and bazaars, nightclubs and tavernas. The most impressive structure, however, is Kos Castle, a fortress erected in 1315 on the east side of the harbor's mouth by the Hospitaller Knights of St. John, who dominated the island just as their fort still dominates Mandraki. Kos was among the first Aegean islands to attract tourists, way back during the 1930's when the Italians governed it and the rest of the Dodecanese. Ancient Halicarnassus, now the Turkish city of Bodrum, home to one of the 7 Wonders of the Ancient World, the Tomb of Masusolus, is a short boat trip away. (The term "mausoleum" is derived from this tomb, which was 45 m (148 ft) high and adorned with sculpted reliefs.) 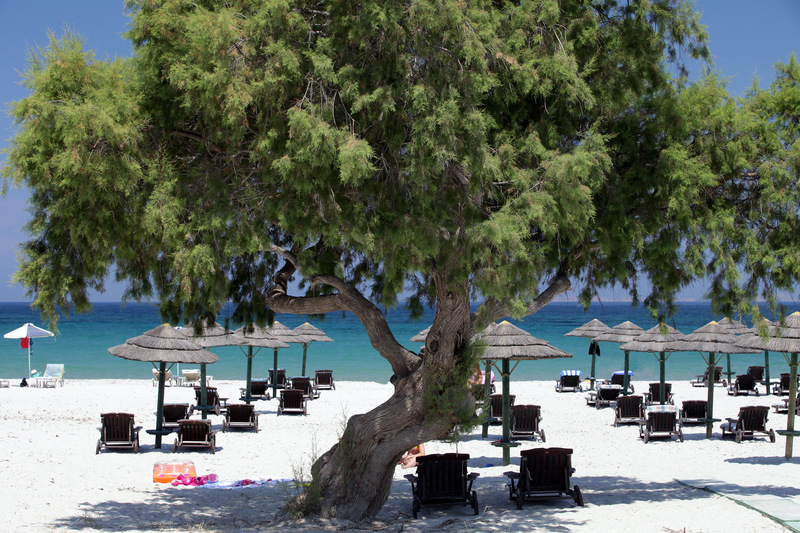 Kos has fertile, productive soil from eons of volcanic activity, and is famous for its melons. Kos supports as many cows, they say, as permanent residents, which number about 35,000. The interior of the island is quiet, undeveloped, and largely flat, which makes travel by bicycle feasible. In the Iliad, Homer mentions the Koans (the name for residents of Kos) sending troops to fight at Troy. Roman mythology has Kos being visited by Hercules. The original inhabitants of the island were the Carians, from southwest Asia Minor. Many of the Carians were professional soldiers, selling their services as mercenaries throughout the Mediterranean Basin. Kos was ruled by Persian tyrants about 500 years after the successful Dorian invasion in 1100 BC. Democracy was adopted on Kos in 366 BC. In that year the capital was transferred from nearby Astypalaia to the new port town of Kos, which had been laid out, as Rhodes Town in neighboring Rhodes was, on a grid pattern by Hippodamus, who also laid out Piraeus, port city of Athens. Hippocrates, "The Father of Western Medicine," was born on Kos in 460 BC. His Hippocratic School of Medicine revolutionized medical science, establishing it as a separate discipline, when it had previously been considered a branch of philosophy and theurgy (literally, "divine-working," a sort of ritual magic). He was the first to propose that illnesses were natural in their causes, and not necessarily spiritual. He trained at the Asklepion (healing temple) of Kos, ruins of which still survive. He moved to Athens, met Plato, who wrote about Hippocrates, and died in Larissa, central Greece, some say at the age of 100. Alexander the Great took Kos in 333 BC. This was followed by the protectorship of Egyptian Ptolmeys. In the century before the birth of Christ Kos fell under the orbit of the Roman Empire, during which time it flourished. In 27 BC the island was devastated by an earthquake, and most of the ancient ruins on view date from that time period. Saint Paul brought Christianity in the 50's AD. Kos was then associated with the Byzantine Empire until the early 1200's, when it was taken and held for a short time by the Genoese after the 4th Crusade. Following another short occupation by Turkish corsairs, the Knights of St. John took over the island in 1337, until 1523, when the Ottoman Turks came. The Turks stayed for 400 years, until 1912, when Kos and the rest of the Dodecanese was transferred to the Italians, in whose hands it stayed until Greece was given sovereignty in 1947. Much of the town was redesigned by the Italians, both before and after a major earthquake in 1933. The city radiates inland from the round Mandraki Harbor, whose shape and narrow mouth uncannily resembles a laboratory beaker. The Italians have dotted the city with buildings of various architectural traditions, including Ottoman, Art Deco, and Rationalist (an Italian style used in the 1920's-30's and emphasizing geometric shapes with ideal proportions.). Much of this was consistent with the public needs of Fascism- this was, after all, during the Mussolini dictatorship- such as the extremely large square now known as Platia Eleftherias where crowds could gather to be exhorted by speakers standing on an elevated platform. After the 1933 earthquake rubble from destroyed houses were removed, exposing ruins from the time of Christ and before. The Castle was kept from deteriorating with regular upkeep, and areas such as the Muslim Bazaar and the Blacksmith's Quarter (Haluvazia) which survived the earthquake were also maintained. As suburban houses were built, space was given over to landscaping, which gives the outer areas of the city a garden-like appearance. 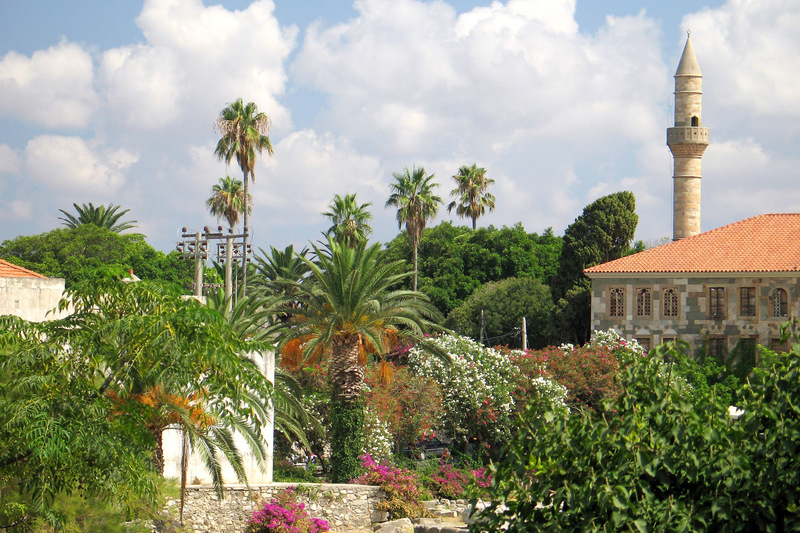 The Castle of the Knights of St. John is a double-walled fortress once accessed by a drawbridge whose moat is now palm tree-lined Phinikon Avenue. Off the landward end of the drawbridge is a small square whose focal point is the very old Hippocrates Plane tree, under which tradition claims Hippocrates lectured. The current tree is about 500 years old, but is thought to be a descendant of the original which stood at that spot 2400 years ago. It is also thought that the Apostle Paul taught under the tree. Next to the tree is the Gazi Hassan Mosque, an extremely large three-story cut-stone structure with minaret dating from 1776. Adjacent to the square to the south is the tree-dotted Ancient Agora, exposed, as has been said, by the removal of the debris of destroyed houses after the 1933 earthquake. The Agora features foundations of a Greek Temple to Aphrodite, and some restored Roman-era columns, among other foundational ruins. There are enough small trees and bushes growing among the ruins to keep the sun from baking the summer visitor too much. Five hundred meters south and west of the Ancient Agora and beyond the Ottoman Bazaar are more extensive ruins, including the Xystos- a colonnaded running track, the Casa Romana, a Villa built by the Romans in the 200's AD and featuring a series of beautifully preserved mosaics, and the Roman Odeon, of which the first 8 rows of seats are the originals. This small odeon has 18 rows of seats which were once clad with marble, a well-preserved orchestra pit, and several statues. Much of what drew people to places like the Odeon were man-to-man gladiatorial battles between slaves, criminal, and prisoners of war. They were also used to present Greek plays. The ruins of the Asklepion are 2.2 miles (3.5 km) due southeast of Kos Town. Built on terraces with a view of the town and beyond to the coast of Turkey, the Asklepion was part spa, part teaching facility, and part religious sanctuary. It had artesian springs, and a main Temple of Asklepion at the top terrace. Much of the old masonry was pilfered by the Knights for their construction projects in Kos Town. The road to the Asklepion, Asklepiou Ave., takes you past the Jewish cemetery on the right, which is right next to the Muslim cemetery, and then through the ethnically Turkish village of Platani (or Kermedes), which features a mosque and several tavernas in the style of Old Anatolia. The 3000-strong Turkish population of the island has dwindled to less than 1000 today, while all of the island's 120 Jews were sent to their deaths, leaving behind only their synagogue dating from the Italian years on Diakou Street in Platani. A mile and a quarter (2 km) north of Kos Town is Lambi Beach, which also is a center of night life on the island. East of Kos Town, then south, as one rounds the eastern end of the island, there are several decent beaches in an area generally called Psalidi. Rounding the end of the island, and then bending back west on its south shore, maybe 7.5 miles (12 km) from Kos Town, there is the resort area of Agios Fokas, featuring the Bros Therma springs, hot water which flows from the base of the area cliffs and mingles with the seawater in a man-made pool circumscribed by rocks in which bathers can loll around in 3-foot deep, warm water even in the dead of winter. It's one of the most popular spots on Kos. Resorts- Like most Aegean islands, the northern coast is windier than the southern. Tingaki, at about 7 miles (11.5 km)on the north, a third of the way down the northern coast from Kos Town, has been a favorite of British tourists for years. Local wines are on offer at the tavernas, which can be sipped while one enjoys the view across the Aegean of the little island of Pserimos, and the Turkish coast further in the distance. Marmari, 2 miles (3 km) further west, is popular with Germans. Mastichari, a further 4.5 miles on the northern coast, and about 2/3 to the western end of the island, is Kos' 2nd largest port. Boats leave for Kalymnos from there. It also features a number of newer, large hotel-resorts. If you is just dropping into Kos without a reservation during the height of the summer season, Mastichari is a good bet to find a decent room. Six miles (10 km) southeast of Mastichari, on the south coast of Kos, is the resort town of Kardemena, offering long, sandy beaches, and nightlife frequented by tourists from the UK. The town also has a combination Folk Art/Maritime Museum. From Kardemena, boats leave daily for the smaller island of Nissyros, miles (17 km) south, which has some very nice, quiet beaches, and quiet villages unspoiled by tourists. The far western end of Kos in largely undeveloped, and sparsely populated. 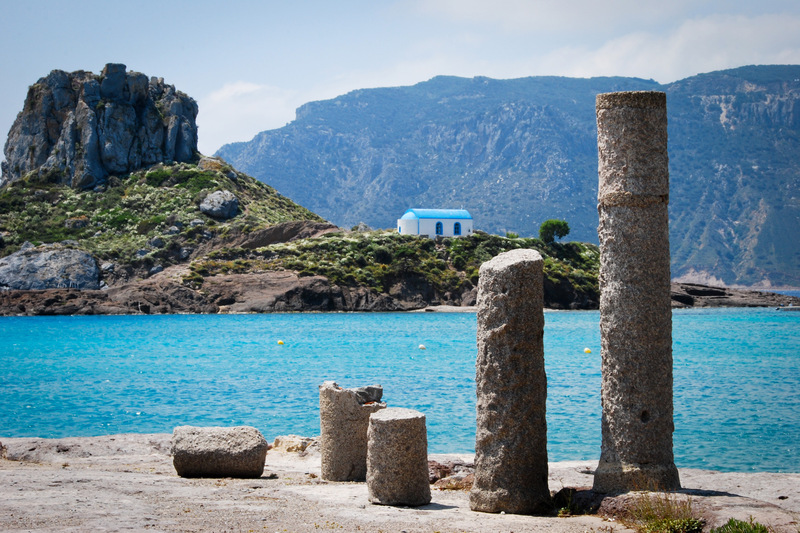 Its largest settlement is Kefalos, little more than a half mile (1 km) inland from the quiet seaside village of Kamari. They're both worth a visit from the adventurous tourist who wants an off-the-beaten-path experience.